The toughest and most customizable moving die rheometer (MDR) for ultimate accuracy and repeatability of all rubber cure graph data and temperature profiling. 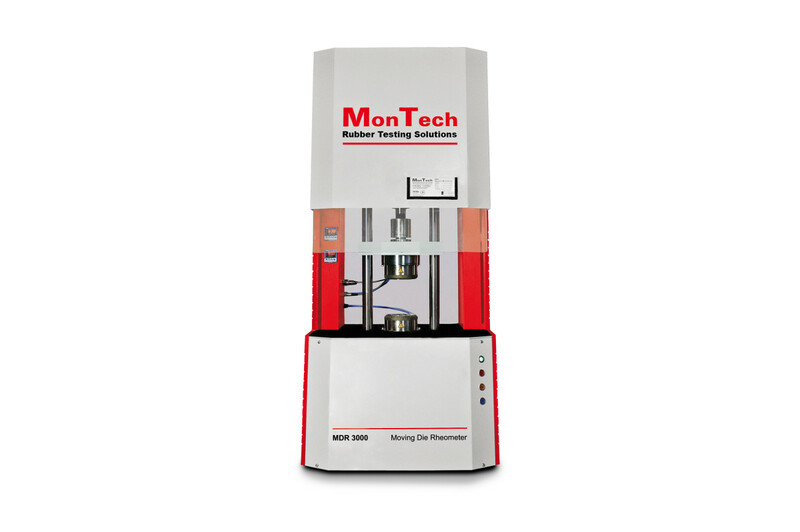 The MDR 3000 rubber moving die rheometer features the tough 3000 series frame made of stainless steel and aerospace grade aluminum. The software programmable MDR motor drive system allows the oscillation strain to be preset from 0.01 to 5.0° while achieving unmatched accuracy and repeatability. Rubber curing systems like the MDR 3000 show the optimal cure time of rubber and its related data points necessary for demanding quality control and research applications. The system includes a combined force/torque transducer and a 2-channel amplifier system for real-time simultaneous measurements of torque and force. 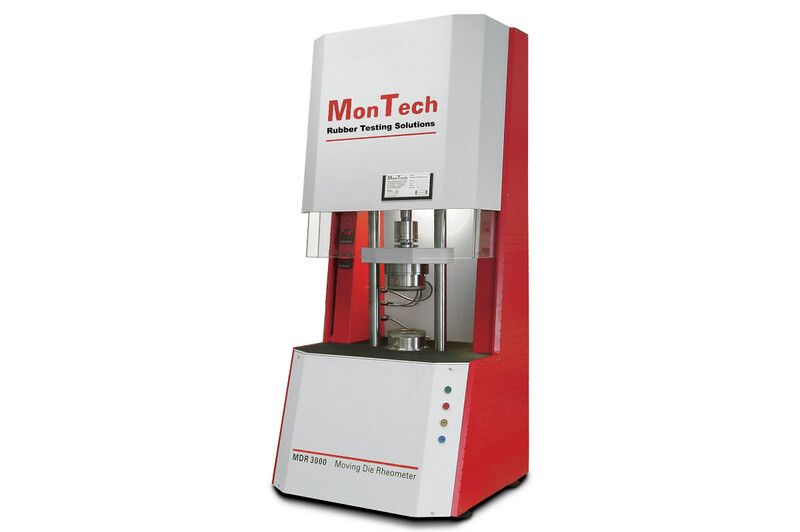 This system measures the normal force to calculate pressure within the rheometer's die cavity. The force transducer and amplifier are balanced automatically before each test. Measuring the pressure and torque simultaneously is an easy way to quantify the expansion/contraction of the compound before, during, and after vulcanization. With this option, cavity pressure can also be controlled either to a programmed or an on-line calculated pressure level. The closing force and die gap are designed as a variable, independent axis so that the cavity pressure can be controlled. This system is especially suitable for test sequences that include curing and a cool-down of the sample for a dynamical mechanical analysis. This system can be utilized to compensate for material shrinkage to avoid any slippage in the test chamber. This technology is patented worldwide by MonTech. Linear automation systems are mainly used for online testing, utilizing a fast and reliable direct conveyor feeder with the lower film as transportation carrier. This system features automated sample loading and unloading with a linear queue of 5 test samples. This ideally suitable for online testing purposes. This system is equipped with the same features as the 5 Sample linear loader, but can queue up to 10 test samples, making this system ideally suitable for online testing purposes and for laboratory testing. Linear automation systems are always the preferred choice for very sticky materials such as silicones or glue that sample loading arm systems might not be able to handle. Tray automation systems allow users to queue larger amounts of samples and leave the testing system running totally unattended over long periods. With MonTech's patented direct sample hadling system, sample placement accuracy and test result repeatability is significantly increased. Samples are handled and monitored by a high-volume vacuum system, ensuring perfect sample pickup, transporation and drop-off - even for less than ideal test samples. This system features automated sample loading and unloading with a direct tray-to-chamber handling system. This pneumatic air cooling system cools both dies separately using independent PID-controllers, rapidly cooling the instrument from higher to lower testing temperatures. When using non-Isothermal and RPA operation modes this system enables cooling at any point during the test. Isothermal cure experiments are the most common quality control test in rubber and elastomer processing. 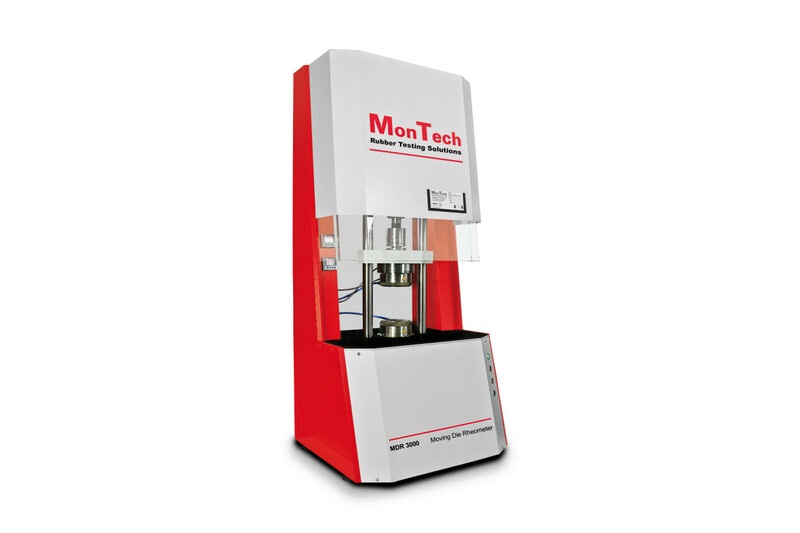 With over 3500 data points available on MonControl, all characteristics including minimum / maximum elastic torque, scorch times, cure times and reaction rates are precisely calculated. Pass / fail statuses and tolerance gates can be easily set and evaluated with each test. Taking place during the curing process, foaming reactions produce cellular membrane-like structures within mixes and are vital part of compound development. The cellular matrix created during the foaming reaction reduces density, increases thermal and acoustic insulation, and affects the stiffness of the mix. MonTech rheometers are optionally equipped with a precision normal force transducer in the die cavity. This advanced transducer reveals interrelations between the simultaneous cure and foaming reaction. MonTech MDRs and RPAs can be programmed to follow any non-isothermal temperature profile to simulate mixing, milling, extrusion, compression molding, injection molding and storage conditions. Non-isothermal test sequences are executed in a single test and can be included with other dynamic tests for the most accurate data discerning material behavior. Test data from similar static or dynamic test sequences executed at different temperatures are evaluated and modeled for an advanced cure kinetics analysis. Information acquired includes: Reaction Rate, Order of Reaction (n), Rate Constant (k), Activation Energy (E) and Incubation Time (ti).